about all Crown City has to offer from new Coronado Real Estate listings through Coronado History. The first place to look when you're coming for a visit. 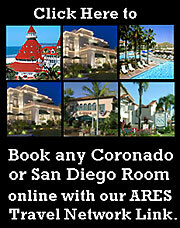 The Coronado Visitor Center Site is full of useful information such as Transportation, Accommodations, Shopping, Must-Sees, Tours, Dining, Annual Events, Recreation, Coronado FAQ's, Maps, Parks, Coronado History, Concert information, Churches, and much more arranged in an easy to navigate format. There is also a free downloadable Visitor's Guide as well as a Coronado Mobile App on their site. Also in this building are the Coronado Historical Association (below) and the Coronado Mainstreet chapter of the National Mainstreet Center. Everything you need to know about Coronado's history. When in town make sure to stop by The Coronado Historical Association. It's in the same building as the Visitor Center and includes a historical museum on the inside as well as patio dining. Check out their website for current exhibits, stop by or visit their store online, and grab a bite to eat before visiting the museum. Download high resolution photos of the California Coastline from the Oregon to the Mexican border, free for personal use. This interface provides a quick interactive access to this project from North Island and the mouth of San Diego Bay to the Coronado Cays. At this point in time just the Kennedy Book. There are many great Coronado Blogs to choose from. The Blogs and Guides on this link are packed with information. What's the difference between a magazine, Blog, or guide? Sometimes the distinction gets a little blurry, but I'm pretty these qualify mainly as magazines. Coronado's only newspaper is delivered free every Wednesday and is also available online. Coronado has three excellent venues for entertainment. For theatre goers there's the Lamb's Players Theatre in the middle of town on Orange Ave., and the Coronado Playhouse, an intimate, 100-seat cabaret-style theatre with a full service bar that overlooks beautiful Glorietta Bay. Then there's The Village Theater, a state-of-the art movie theater that originally opened in 1947, was abrubtly shut-down in 2000, and recently re-opened complete renovated in June 2011. The image to the left shows Coronado's three public schools, all within a stone's throw of one-another. Go to our schools link for high resolution photos of all three, as well as info about all the educational oppotunities in Coronado. Every Sunday from Early June through Early September there is a free concert at Spreckels park. If your stay here includes a weekend this is a great place to spend Sunday afternoon. On the first and third Sunday of each month, year round, from 9am to 4pm, there is an art show featuring more than fifty top artists. Combine this with the concert for a full afternoon of Coronado Fun. From High School Football to Lawn Bowling, Coronado has a lot to offer the sport enthusiast. Here you'll find links to all sports releated sites on the Island. For a list of Real Estate Agents who specialize in Coronado. Stuck in someone else's frames? CLICK HERE to escape or HERE to open this page in a new tab.. If you've come here looking for San Diego Track Magazine, click on the link above. For over a decade I've been hosting the CIF high school track and field results on Crowncity. If you're a high school track fan this is where you'll find past and present results for all San Diego Section Schools. Along those lines if you're a fan of Coronado Track and Field you'll find that site here, along with thousands of photos. If you've noticed the "Concert" mosaic at Spreckels Park, the "Sunset mosaic at the Cays Tennis Court, the "Golf" mosaic at the Coronado Golf course, the "Water" mosaic at the Coronado High Swimming Pool , or on the Coronado High School grounds, the "Universe" mosaic, the "Sweet Piece" mosaic or the "Math" mosaic, you know the work of Kirstin Green. She's also available for private commissions.